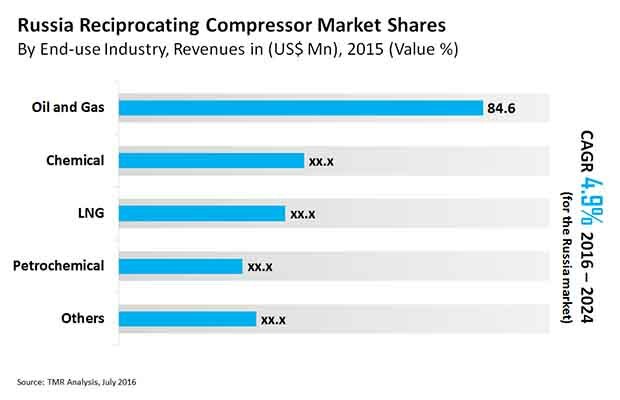 Some of the prominent players operating in the Russia reciprocating compressors market are Atlas Copco AB, Dresser Rand Group Inc., Kobelco Compressors Corporation, General Electric (Oil & Gas) Co. and Howden Group Ltd.
As per the recent TMR report, the Russia reciprocating compressor market is expected to reach a value of US$352.6 mn by 2024. The market was valued at US$227.1 mn in 2015. During the forecast period from 2018 to 2026, the Russia reciprocating compressor market is predicted to expand at a CAGR of 4.9%. Based on end user, the Russia reciprocating compressor market is segmented into chemical, oil & gas, petrochemical, LNG and Others. Among all of them, Oil and Gas Sector holds maximum potential in the Russia reciprocating compressor market. Based on type, LNG has been identified to present lucrative opportunities to this market. The Russia reciprocating compressor market is growing owing to the increasing support from the government of the country. For instance the government of the country has taken several initiatives to empower subsea application of reciprocating compressors. This has thus increased the demand for reciprocating compressors. Further, the Ministry of Industry and Trade of the Russian Federation has formulated several rules and regulations that positiveily impacted the growth of the Russia reciprocating compressor market. The government has restricted the use of energy equipment within the country. This has helped to provide growth opportunities to local manufacturers, and thereby strengthen growth in the region. Favorable Foreign direct investment (FDI) policies by the government for the Technological advancement and innovations in the energy sector has helped local manufacturers deliver international quality standard. This will help augment the output efficiency of manufacturers in the Russia reciprocating compressors market. On the basis of end user, oil and gas industry is leading the Russia reciprocating compressor market and it is expected to continue in the near future as well. It holds a major share of the regional market and it pegged to achieve 42 percent share by 2024. However, the oil and gas sector in Russia has been facing a storm of challenges mainly due to the stagnant European market, expensive Asian projects, and strict Western sanctions. This has resulted in limited investments and technological innovations of the oil and gas industry in the market. However, with significant government initiatives the oil & gas industry is likely to offset the challenges to a considerable extent, and thus holds lucrative prospect ahead. On the basis of type, industrial process gas reciprocating compressors is leading the regional market, and it is projected to continue the same in the near future.